On a sunny morning in January, I went for a walk around Edgbaston Reservoir in Birmingham, England. The reservoir, originally known as Rotton Park Reservoir and referred to in some early maps as Rock Pool Reservoir, is a canal feeder reservoir and it is supplied by small streams and was formed by damming a small stream. The dam is a 330 metre long earth embankment with a height of 10 metres near the centre. It was extensively enlarged by Thomas Telford between 1824-1829 to supply water to the Birmingham and Wolverhampton Levels of the Birmingham Canal Navigations (BCN) canal system via Icknield Port Loop at the foot of the dam. It was excavated to a depth of 40 feet (12 m) and covers an area of 58 acres (230,000 m2), holding 300,000,000 imperial gallons (1,400,000 m3) of water, and was the largest expanse of water in Birmingham at the time. Despite its name, it is actually situated in Ladywood rather than nearby Edgbaston. It is situated close to Birmingham City Centre and is a Site of Importance for Nature Conservation. In addition to supplying water to the canals, the reservoir is used for leisure activities including angling, sailing, windsurfing, canoeing, kayaking and rowing. Edgbaston Reservoir is home to two rowing clubs, Birmingham Rowing Club and the University of Birmingham Boat Club. Both are housed within the same boathouse. The site has also been chosen to house a new Birmingham Schools rowing initiative, with the two aforementioned clubs assisting in the running of the scheme. Birmingham Canoe Club also share the space during the summer months (June - September). The Reservoir is also home to Edgbaston Watersports, who provide water and land activities for school, college & youth groups from their base on the Icknield Port Road side of the reservoir. The Reservoir perimeter provides a pleasant route for joggers, with a gravel and tarmac path throughout its 1.75 mile (2.8 km) circumference. Today's article from Picture Correct, creates a new slogan particularly for photographing wildlife and is written by Mario Fazekas, a wildlife photographer from South Africa, whose website is Kruger to Kalahari. We have seen a few different slogans relating to the five “P’s” for improving photography in general such as ‘Proper Planning Prevents Poor Performance’ or ‘Proper Planning Produces Perfect Photos’ but nothing detailed or specific to wildlife photography. We therefore compiled the following list of five “P’s” that if followed, will assist you in capturing better wildlife photographs................Follow this link to read the full article. Here are a few of my own wildlife photographs which I hope you enjoy. We saw the Presidential Elephant Herd, which were obviously used to tourists and came very close to our vehicle. This one was only about five feet away. The herd was given its name after President Robert Mugabe awarded it a presidential decree in 1990, although nowadays its future is in doubt. A Cheetah in the Serengeti, Tanzania. The Zanzibar Red Colobus (Piliocolobus kirkii) is a species of red colobus monkey endemic to Unguja, the main island of the Zanzibar archipelago. The Zanzibar Red Colobus is endangered and there are about 1.500 monkeys left. A Hippopotamus on the Serengeti, Tanzania. 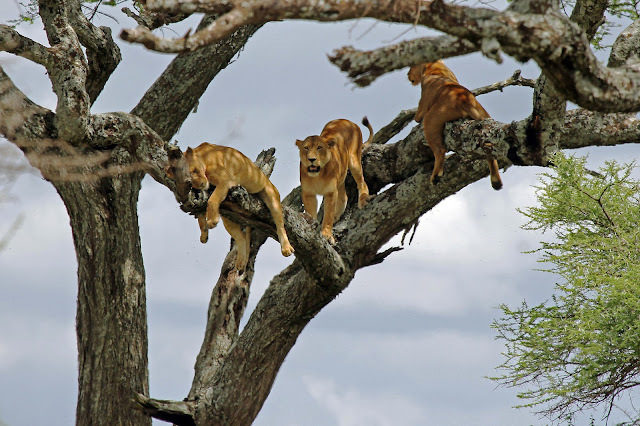 Three lions in a tree on the Serengeti, Tanzania.